My onboarding page. Need an example of an on boarding page? Click here to see mine. Organize & Automate. Interested in learning more about streamlining your onboarding process? Sign up to be the first to hear when my course, Organize & Automate, launches on June 14th. This month, all of my blog posts have been about streamlining your freelance business. I’m a systems nerd- I LOVE systems. Without them, my freelance design business wouldn’t have seen the level of growth that it has over the last twelve months. That’s why I’m creating a course on Organizing & Automating your design business, and I’m sharing snippets from the course in my blog posts! My post on creating a goodbye page for your clients went down really well with the designers that follow me. I can’t tell you how happy it made me seeing people’s responses to that post when it was publisheD and sent to my email subscribers. When you’re launching a course, all kinds of crazy fears and doubts creep into your mind like: what if no one is interested in this? What if this isn’t what my community needs from me?? Seeing the responses to that blog post (which was taken from a lesson in my course) calmed my doubts and allowed me to get more excited about what I’m launching. I wake up every day feeling excited about my course, counting down the days until I get to share it with you guys. That’s a pretty amazing feeling. Expect more organization & automation blog posts from me over the next month, friends! After that, I’ll start blogging about more freelance topics. I added a new lead magnet (freebie) to my website this month to build my course launch list. Whoever signs up for my new freebie, 39 must-have tools for designers and freelancers, gets added to my course launch VIP list because they’ve expressed interest in the freebie which is part of the course. Everyone on my launch list will receive my launch emails starting June 14th, and everyone that isn’t on that list will only receive a few. This is so that I don’t annoy my whole list with launch emails, because this course isn’t going to interest my whole list. In fact, it’s only going to interest a small percentage: designers. I was going to make my course open to all creative entrepreneurs, but I realized something: there are lots of courses out there that are for creative entrepreneurs, but I haven’t seen ANY that are just for designers. Any kind of freelancer will benefit from Organize & Automate, but it’s made especially for designers. I currently have 1050 people on my launch list. I’m hoping to build it to 2000 before the launch. I’ve using Twitter and Instagram to share images of my freebies and get subscribers. 2. My existing email subscribers. I’ve been sending emails to my existing subscribers about my course to see who is interested and who I should be sending launch emails to. Instead of telling my subscribers to go to my O&A sign up page, I sent them directly my 39 must-have tools checklist and my batch day checklist. I used Convertkit to create a link trigger, so that anyone who clicks those links in my emails are added to my launch list. In May, I teamed up with my friend Erin to host a webinar together. That resulted in me gaining 160 of her subscribers, and they are SUCH cool people. It’s an honor having them on my list. In June/July (we haven’t decided yet), I’m guest blogging for ByRegina.com using a lesson from my course. Again, this is a way I can expand my audience and build my launch list. 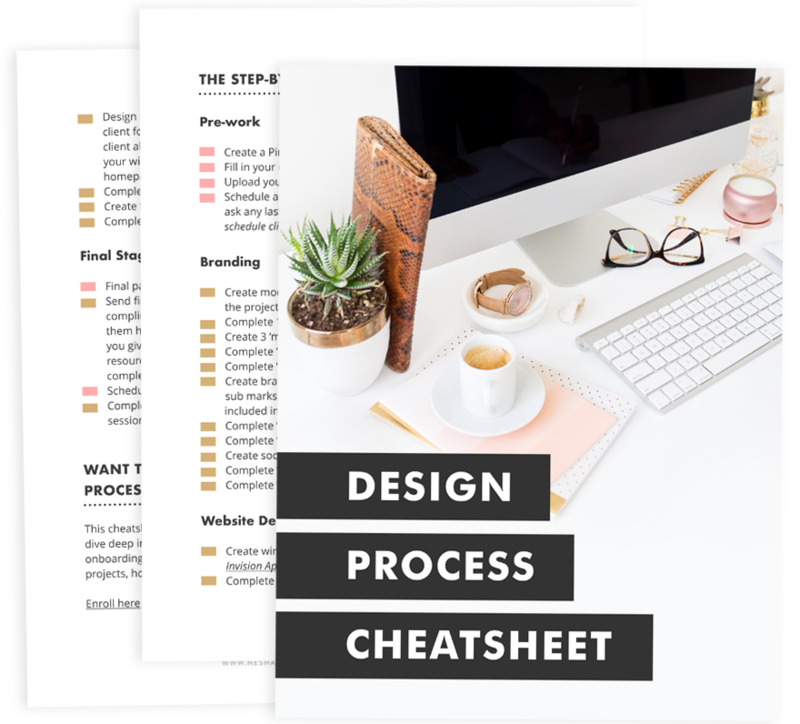 If you’re a designer and you’re interested in organizing your business and streamlining your systems, sign up to hear about my course launch here. So I’ve already told you a bit about my list-building and blogging strategy leading up to my course. Now I want to get real with you. Launching is hard. It’s exciting, liberating and beautiful, but it’s hard. At first, I was trying to launch the way everyone on the internet says you should. But I realized I need to launch MY way, not the way that’s popular. I want to enjoy my launch and take it as easily as I can. Because I’d been packing my launch with too much. I was planning on doing a Periscope series, three webinars, an Instagram series, blah blah blah. I got to a point where I had been on Skype for an hour with a potential webinar partner, and we still hadn’t sorted out what the webinar would be about. My course content is what’s most important. I want to create the BEST content I can for you, and I can’t do that if all my time is taken up planning webinars. I politely told my partner that I couldn’t do the webinar the way we were going to, and while I felt a bad initially, I felt like a load had been lifted off my shoulders. Now that I don’t have as many things to do for this launch, I can enjoy creating the content more. Pre-launch Organize & Automate on June 14th. The course will be open to pre-orders on June 14th and you’ll get $50 off! Sign up here if you want to be notified on the day and learn more about O&A. Launch Organize & Automate June 30th. My prelaunch will last for two weeks and then the course will officially launch on June 30th. The imperfect boss. In May, my friend Ashley hosted an Instagram challenge called #theimperfectboss. Thousands of lady bosses united to post a business confession they wouldn’t usually share with the public. It was INCREDIBLE to see so many people opening up about their business insecurities. It was the perfect way to show women out there that running a business ins’t for the perfect looking, sounding or doing. Anyone can run a business, imperfections and all. Head this way to see what my confession was, and then click here to see the whole collection. It’s pretty inspiring. Screencast-O-Matic. I’ve been recording content for my course all month, and Screencast-o-matic is one of the tools I’ve been using to do it. It makes recording your screen really easy, and it comes with lots of professional tools you can use. The life-altering power of a positive mind. I wanted to drop in a resource that isn’t business-related because I think EVERYONE should listen to this. It’s a talk by Shawn Achor for Super Soul Sessions about transforming your negative mindset to a positive one, and the benefits that will have on your business, life and health. The exercises her suggests we do to change our mindset only take a few minutes each day, yet they are so impactful. Organize & Automate. Interested in learning more about streamlining your design business? Click here to sign up to the VIP list and be the first to hear when the course relaunches on June 14th. All VIP’s will get a $50 discount and some epic fast-action bonuses! Hellosign. Need a tool that allows you to send your clients electronic invoices? Hellosign is my favourite. Pancake. If you want to start creating professional invoices for your clients, I recommend Pancake. It allows you to create estimates, proposals and invoicesand it’s a one-time fee. Pay once and use it forever!